Djamel Dib is another novelist whose name is said to make the top 10 in the Algerian detective-story writers category. Another francophone writer, sorry about that. Dib is said to be part of the second wave of Algerian detective novel's development (started from the mid-80s). 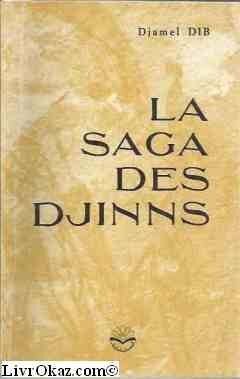 The Djinns' Saga (La Saga des Djinns) was published in 1986 by the Entreprise Nationale du Livre. La Saga des Djinns starts off well enough. It is set just outside Tamanrasset on an oil dig in the mid 80s. The inislimen Moussa Abegui is on his way to his zaouia to enter a long meditation. He knows trouble is coming (1) and blood is about to pour as an ancestral secret has been violated. He is very good friends with Obed, the director of the oil dig managed by an all Algerian crew of specialists. As Sheikh Abegui makes his way followed by a strong sense of unease, three murders occur on the rig. That is when inspector Antar arrives, assisted by his two detectives, l'Apprenti and le Moco. The character of Antar and l'Apprenti are said to be a continuation of l'inspecteur Tahar. Antar is not funny though, it is the couple l'Apprenti and le Moco who are relied on to bring banter and comedy. Well, supposed comedy. It is l'Apprenti and le Moco's series of reparties and nonsensical discussions that keep interupting the story flow, so much so that by the time they are done chewing the fat, we're nearing page 180, Sheikh Abegui whom we had left off in great despair re-emerges at around page 200 beaten up to a pulpe! And the murders continue while no one understands a thing, least of all the reader. The story centres around the many illicit trades that enter and exit through the Algerian desert, by air and by jeep. I found the disguised facts that Dib brought in regarding that aspect very informative, but I doubt I'll read Dib's other two novels, La Résurrection d'Antar (1986) and L'Archipel du Stalag (1989). Dib's vocabulary range is large and very enjoyable, he is also a master of registers, going from the highly literary to colloquial French in a roller-coaster manner. It is the excess which is a spoiler. My main axe to grind with his style is the adjective overdose and drowning the story in ramblings that are passed off as comedy. I've met that kind of comedy in a popular French polar serial before, the name of which I cannot remember. It also features an overweight assistant detective bent on repartie overdrive. Dib apparently is "one of the most important and interesting author of the genre since Youcef Khader" but having just finished his novel I would beg to differ though. This novel is 237 pages of schizophrenic writing. That is to say, it contains about 130 pages of a potentially very good detective novel, with the remainder to be placed in a recycle word-bin. I wonder if those who read Algerian literary production and make such statement as the above cited article actually read the novels, or simply view any Algerian lit with the orientalist's paternalising eyes that make them see any such lit as cute and because the bare-footed native has learnt to write.